Is this the first step toward nonhuman judging panels? Mentally keeping pace with the twists, flips, and jumps of a top-level gymnast is no easy task. Olympic judges have to be able to watch performance after performance, noting even the subtlest of movements so they can deliver scores that accurately determine which athletes deserve to go home with the gold and which go home empty-handed. However, just like doctors, lawyers, and a seemingly endless list of other professionals, these judges could find themselves replaced by automated systems in the not-so-distant future. The International Gymnastics Federation (FIG) plans to use an artificial intelligence (AI) developed by the Japanese IT company Fujitsu to help judges score the 2020 Olympic Games in Tokyo. 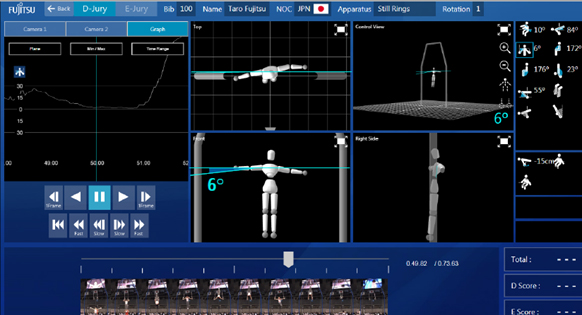 According to a video describing Fujitsu’s software, the system analyzes data collected via 3D sensors during gymnasts’ performances. 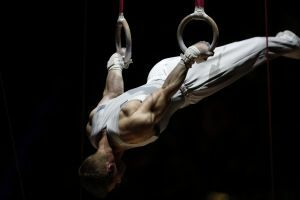 It then almost instantly provides details about each performance —everything from the height of the athletes’ vaults to the angle of their legs during a balance beam routine. After comparing this information to international gymnastics committee standards, the AI produces a score. If it works as expected, Fujitsu’s AI system will remove some of the subjectivity from judging. Olympic figure skating judges have been known to favor competitors from their home countries, and that favoritism could reasonably extend to other sports like gymnastics. Favoritism aside, judges could have other biases they might not even realize, like a tendency to score performances differently based on the time of day or favoring a certain style of routine over another. While Fujitsu president Morinari Watanabe told The Guardian in November 2017 that he is confident that gymnasts will embrace the use of AI technology for scoring, others are skeptical that it will be an improvement over human-only judging panels. Olympic athletes are constantly pushing the limits of their sports, and an AI system may not be able to understand and adequately score a move it hasn’t seen before. Perhaps more importantly, as with any technology, Fujitsu’s system could be hacked by competing nations or even just fans of certain athletes. “Whoever has an interest in the outcome of these major sporting events will also have an interest in trying to take advantage of any such system,” Betsy Cooper, UC Berkeley’s executive director for long-term cybersecurity, told The Guardian. In 2020, Fujitsu’s AI will merely serve as an assistant judge of sorts, providing human judges with extra information. However, if Olympic committees are pleased with its performance, we may not be that far away from all-AI judging panels — and the potential for tampering that comes with them.